Tomb Raider's rebooted Lara Craft is jumping into another adventure, courtesy of veteran comics author Gail Simone. 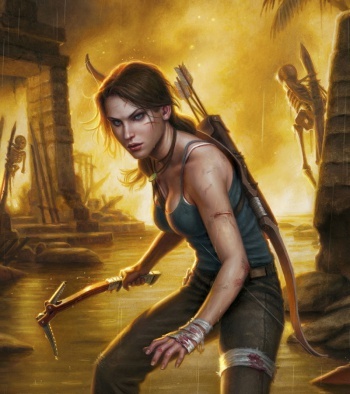 The 2013 reboot of Tomb Raider served as an origin story for the gaming icon that is Lara Croft. Now that we've seen the humble beginnings of this new interpretation of the classic character, she's ready to set off on a new series of adventures - starting not with a video game, but a comic book. Esteemed comic writer Gail Simone (known for her work in Batgirl, Wonder Woman, and Deadpool) is penning the next chapter of Lara's story, which will pave the way for her next video game outing. Gail Simone is a diehard fan of the Tomb Raider series, and is thrilled to be working on Lara's story. "We start just a few weeks after the end of the game," Simone says. "It will be Tomb Raider canon, and lead DIRECTLY into the sequel. This is what got me excited; we get to be part of Lara Croft history." The comic will see a return to Tomb Raider's globe-trotting roots, but the experience is different when viewed through the eyes of the reboot's more well-rounded version of Lara. "The way I see Lara now is, she's not after treasure," Simone explains. "She's not really after thrills. She's a questioner, she's an explorer. She wants answers." The comic series will be published by Dark Horse with the first issue due on February 26, 2014.